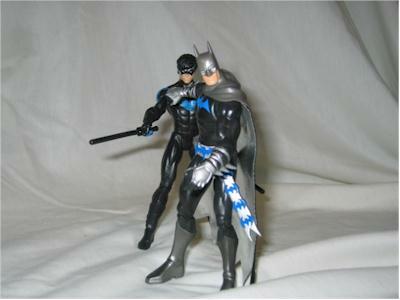 Javier is back tonight with another Batman 2 pack review - this time it's Batman and Nightwing. Take it away! I'm putting my hat in the playing field and attempting a review...again. 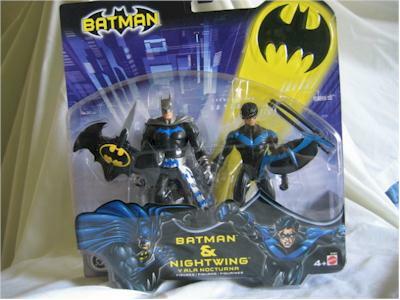 This time it's the Batman & Nightwing (aka Boy Wonder is a man now) 2-pack. I personally like Robin as Robin. Dealing with growing up and having to maneuver around an over protective guardian. Nightwing is just another adult crime fighter. The figure is this 2-pack is pretty cool though. If these were in a smaller package perhaps I would like it more. I don't display much that are still in their package, but I do like the smaller clamshells ala McFarlane. This card is large. The figures and accessories are clearly visible which is a good thing. There are trays holding the figures and accessories in place. These trays also seem to help, at least a little, in preventing crushing of the plastic bubble. The graphic on the bubble of Nightwing is similar to the figure in the package. 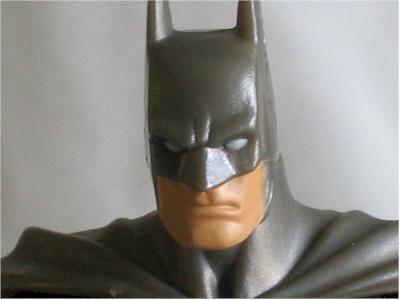 The Batman graphic, however, is of a traditional Batman and not the spiffy sash welding figure you've just purchased. 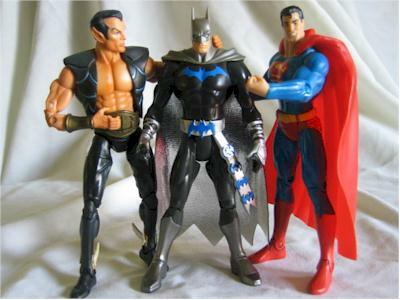 There are only three twist-ties; two around Batman's arms and one holding Nightwing's shield which isn't really holding it because it came right out without undoing the twisty. The figures appear to be holding hands as my 4 year-old pointed out. Batman is good, but this is a variation on a variation Batman. I'm not well versed in Batman's history, but I would hope he never actually wore this outfit. He has silver straps around his gloves reminiscent of Eric Draven. This particular Batman has a sash and the word sash and Batman should never be in the same sentence. As cool of a character as Batman is even he can't make a sash look cool. The left hand is sculpted differently then the other Batmans in this line. It appears he should be holding some sort of weapon. It's probably sculpted this way to hold the accessories in the single carded Ninja Batman. The cape is thicker then the regular line Batman. The inside of the cape is a shiny silver and the outside is black. As with the Batman/Superman pack it reminds me of a wet suit without the elasticity. The sculpt is good on this figure, but Ninja Batman? 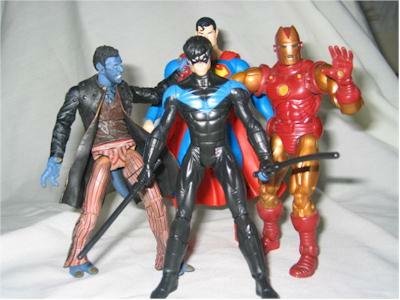 The sculpt on Nightwing is okay. I would venture to guess this was not done by the Horsemen. It seems over worked. 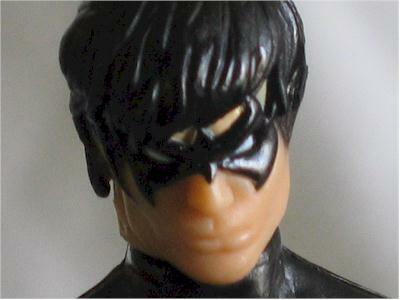 There's a simplicity to the Batman sculpt that makes it beautiful which Nightwing lacks. The right hand is sculpted so that his fighting stick is always extended out (see picture). 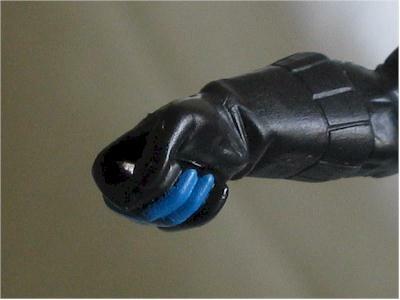 The gloves are of hard plastic and not of the soft rubber Batman's are made of. The face is sculpted with a brooding pout. The pout, however, appears more like 'I didn't get the toy I wanted' pout rather then a brooding pout. Maybe he is just trying to blow a kiss who knows? The more I look at the face the more he reminds me of Bruce Lee as Kato. He has sculpted boots and is able to stand on his own. Which is good since he has no peg holes. Both figures have good paint applications with Batman's being just a little better. Bat's face has the matte flesh tone which I like. The silver straps are nice and clean. The chest logo has crisp lines. The only problem are the bats on his belt and sash. Some are not covered completely and others have over spray. 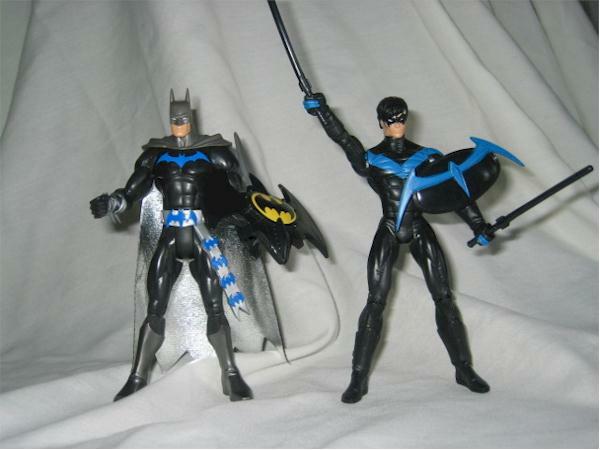 The chest logo and belt/sash bats are blue to match the blue on Nightwing, but it doesn't seem to work well with Batman. 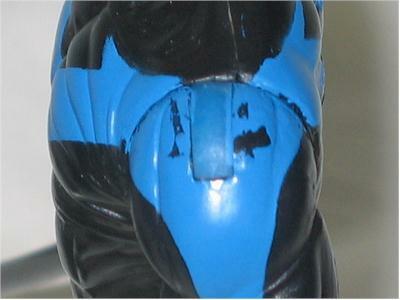 Nightwing's paint applications are simple; an all black figure with with a 'V' shaped chest and back design. In some places the lines are nice and clean while in others they're a little sloppy. There was over spray around the hairline and the paint on the left shoulder started coming off as I moved the ball-joint around. The other shoulder is fine. Batman and Nighwing both have 10 points of articulation: neck, shoulders (ball-joint), forearms, waist, hips, and knees. 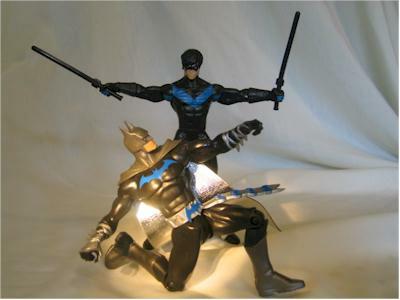 Nightwing gets a 1/2 star taken away because he seem far more stiff then Batman. This may have something to do with the 'over worked' sculpt. You can pose both figures, but the poses are more like 'take my picture now' then real action poses. Batman comes with a combat shield which doesn't look very good on his wrist. It's a little too big. It also looks like it should be launching something rather then protecting Bats from flying projectiles. The shield would look much better if it didn't have that sharp silver/gray point. Removing it may improve the look of it. At least it's not a combat communicator. The bat logo is painted on cleanly. It serves better as a decor piece then a shield. Nightwing comes with two fighting sticks and a shield. The fighting sticks fit nicely into his sculpted hands. The sticks on mine are a little bent. A little warm water should straighten them right out. I like Nightwing's shield better then Batman's. It is smaller and appears would be more functional in a real fight. The problem is that the clip fits tightly on his wrist which over time may scrap the blue paint off. At around $7.50 a figure the price isn't bad or good. The Batman variation in this pack is probably a version most collector are passing on as a single carded figure. If they are buying it it's for a custom or they really like the accessories. The reason you purchased this set is for Nightwing. Depending on how you look at it your paying between $7.50 and $14.99 for Nightwing. At $7.50 you're getting a decent figure at about what he would have been as a single figure. If you see it as $14.99 then skip this figure that's way too much for this only decent figure. I see it as $7.50 with a Batman I'll eventually customize. Batman is just...well okay. He can just go sit and watch Chicago in his sash welding outfit. If you can customize I say do so. 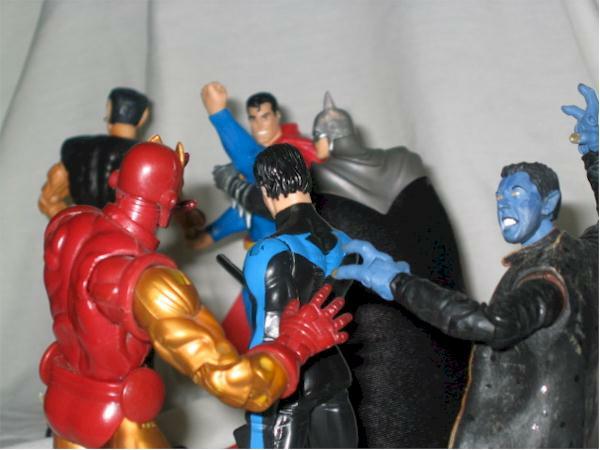 Nightwing is cool, a little stiff, but cool. A little more articulation would probably have been good. I don't own other Nightwing figures, so right now he's the best I've got. If you're a big Nightwing fan then pick this set up. I can see this one displayed with a customized black outfit Batman, and not the Moulin Rouge Batman he came with. I picked mine up at Target for $14.99. Since they appear to be short-packed, 1 to a case, finding one may be a little difficult. Figures from the collection of Javier Osuna.